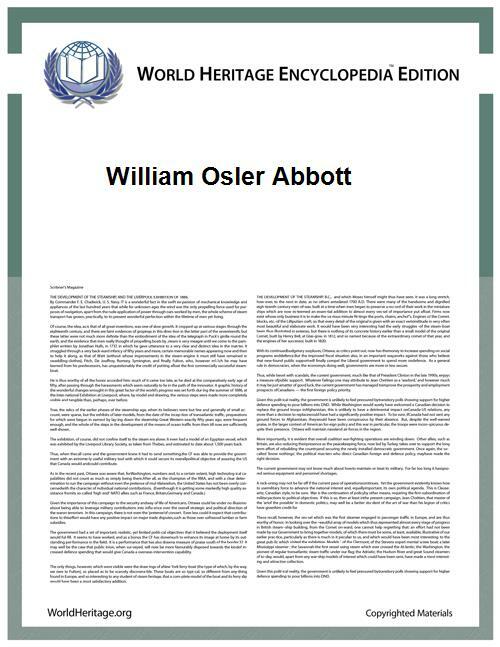 William Osler Abbott (1902 – 1943) was a United States physician, son of Dr. Alexander C. Abbott and Georgina Osler. His most notable contribution to the field of medicine was his part in the development of the Miller-Abbott tube, used in decompression and stenting of the small intestine, alongside Thomas Grier Miller, and also for devising the Abbot Rawson tube. Abbot received his MD in 1928 from the University of Pennsylvania. He died of myelogenous leukemia in Waquoit, Massachusetts on September 10, 1943. This biographical article related to medicine in the United States is a stub. You can help World Heritage Encyclopedia by expanding it.